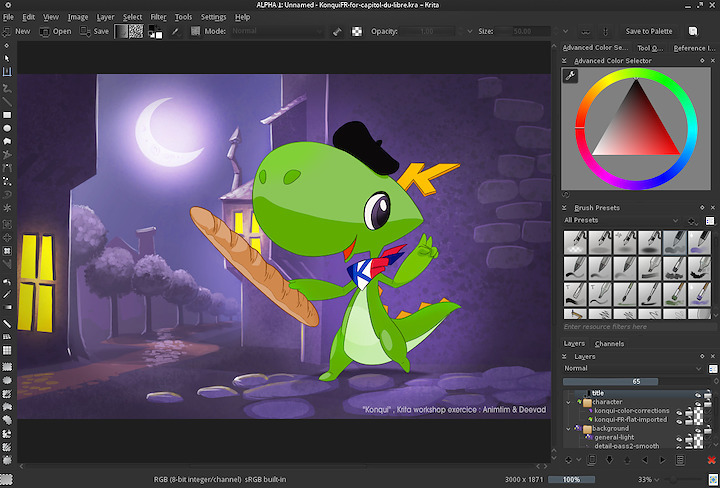 Join me and Timothée Giet ( aka Animtim ) for a French workshop about Krita on the event Capitole du Libre 2013. The workshop will be split in 2 parts , first by Timothée about toon character creation , with line art and flat coloring , and second part with me , introducing easy way to layout toony painted background. License: CC-BY David Revoy, www.davidrevoy.com, 15 november 2013 . Bonjour David, auras tu la possibilité de mettre en ligne des vidéo de tes interventions ? @Franck B : Bonjour , j'ai vue des personnes qui filmaient ; ils m'ont dit que ce serait sur le site de Capitole du Libre ou de Toulibre bientôt. How exciting! Will there eventually be a video? This is exactly useful for the things I like to draw and paint, but it's a bit far to see live. How beautiful this is!! So awesome!! Very impressive post . I'm inspire to see this.